Security threats are becoming increasingly sophisticated and harder to detect. Many small and medium-sized enterprises are still convinced that a firewall, antivirus and anti-spam software are enough to protect their networks. With cyber-crime on the increase, it is imperative that organizations are aware of the security threats that they face on a daily basis. 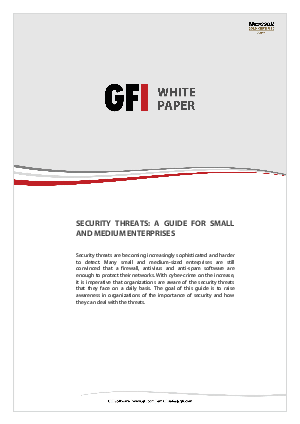 The goal of this guide is to raise awareness in organizations of the importance of security and how they can deal with the threats.